Rome: Italy’s government easily won a confidence vote on its tough austerity package on Friday, the first step in parliamentary approval for sweeping measures aimed at saving the euro zone’s third-largest economy from financial disaster. The plan, contested by Italy’s unions and the opposition Northern League, has been in effect since Monti’s government approved it on 4 December. But it needed full parliamentary approval within 60 days to remain in force. The upper house, where Monti is a life senator, is expected to approve the package definitively next week, most likely in another confidence vote. Monti, a former European commissioner, called the vote in the lower house to speed the package through parliament and avoid debate on dozens of amendments, mostly tabled by the League which has tried to obstruct the measures. The package, which has been hailed by Italy’s European partners, will cut costs, raise taxes and reform pensions in a bid to restore market confidence in Italy’s finances and balance its budget by 2013. The collapse of investors’ confidence during the summer under the previous government of Silvio Berlusconi thrust Italy to the centre of the euro zone debt crisis and pushed its borrowing costs to untenable levels on bond markets. While Monti has seen his popularity slip slightly in opinion polls since he formed his technocrat government nearly one month ago, his overall support in parliament is strong. The two biggest groups, Berlusconi’s centre-right People of Freedom Party (PDL) and the centre-left Democratic Party (PD), support the government although both want it to soften the plan’s impact on their core supporters. Both parties know they cannot sabotage the government despite their misgivings without risking an economic catastrophe that would probably lead to a sovereign default and destroy the euro currency. “We would have wanted more but we will continue our battle ... to support those who don’t have a voice," Dario Franceschini, lower house PD leader, said in his pre-vote address to parliament. “This is just the beginning. Our aim is to save our country," he said. PDL parliamentary leader Fabrizio Cichitto, speaking as Berlusconi sat next to him in the cramped party benches instead of the government dais he occupied until last month, said: “We are entering a recession and we realise this calls for extraordinary measures". But Cichitto asked Monti to introduce more measures to stimulate growth and called some of his proposals to liberalise closed professions, “Stalinist style". Pressure from the centre-right has forced Monti to delay plans to liberalise some sectors, such as pharmacies, taxis, lawyers and notaries, which are still protected by unions and guilds which want to keep their numbers low. 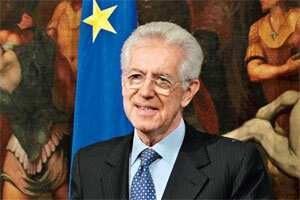 The devolutionist League and the small centrist Italy of Values party voted against Monti. The Northern League heckled him in the Senate earlier this week, holding up placards saying, “This is not a budget, but a hold-up." At Friday’s vote, League parliamentarian Emanuela Munerato turned up dressed as a factory worker to suggest the working class is most hurt by the austerity package, which the government says is necessary to prevent economic ruin. Analysts say soaring borrowing costs and the prospect of a fast-deepening recession still threaten to undermine Italy’s fiscal consolidation efforts, while much of the country’s fate is out of its hands, as investors react to a lack of decisive action by European leaders to face the broader debt crisis. Underlining the depth of the crisis, the main employers’ lobby Confindustria on Thursday slashed its growth forecast for Italy next year to minus 1.6 percent from a previous estimate of plus 0.2% and said the country was already in recession. It said even this forecast was based on Italian bond yields dropping to below 5% by April compared to around 7% now -- the level at which Ireland, Greece and Portugal were forced to take bailouts.